Saint Irenarchus the Recluse of Rostov was born into a peasant family in the village of Kondakovo in the Rostov district. In Baptism he received the name Elias. 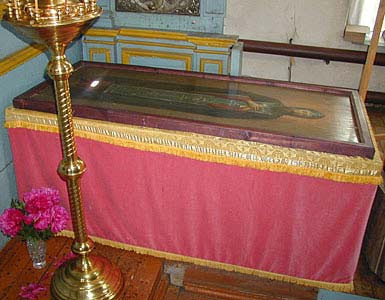 In his thirtieth year, he was tonsured a monk at the Saints Boris and Gleb Monastery in Rostov. There he began fervently to labor at monastic tasks, he attended church services, and by night he kept vigil and slept on the ground. Once, taking pity on a vagrant who did not have shoes, Saint Irenarchus gave him his own boots, and from that time he began to go barefoot through the snow. The abbot did not care for such behavior, and he began to humiliate him, compelling him to stand for an hour or nearly two in the snow opposite his cell, or to ring the bells for a long time. The Saint endured everything with patience but he did not change his conduct. The abbot continued to be hard-hearted, and the monk was obliged to transfer to the Abramiev Theophany Monastery, where he was accepted into the number of the brethren and he was soon chosen as steward. 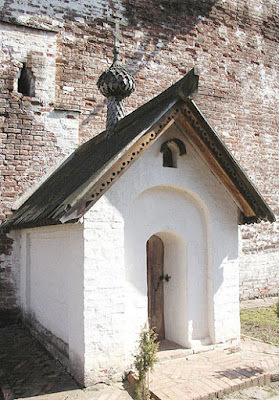 Leaving Abramiev Monastery, Saint Irenarchus transferred to the Monastery of Saint Lazarus in Rostov, settled into a solitary cell and lived for three years in privation and hunger. Here he was visited by Blessed John the Fool (Nov. 12), nicknamed “the Big Simpleton” and "the Hairy". The saints encouraged each other by spiritual conversation. The Elder, however, had a desire to return to the Saints Boris and Gleb Monastery. He was accepted back with love by the strict Barlaam, and he began to pursue even greater ascetic deeds at the monastery. Saint Irenarchus spent twenty-five years shackled in chains and in arduous tasks. His ascetic deeds were a silent reproach to those living carelessly at the monastery, and they lied to the abbot about him. They said that the Elder taught that they should not do monastic work, but rather pursue asceticism as he did. The abbot believed the slander and he banished the holy Elder from the monastery. 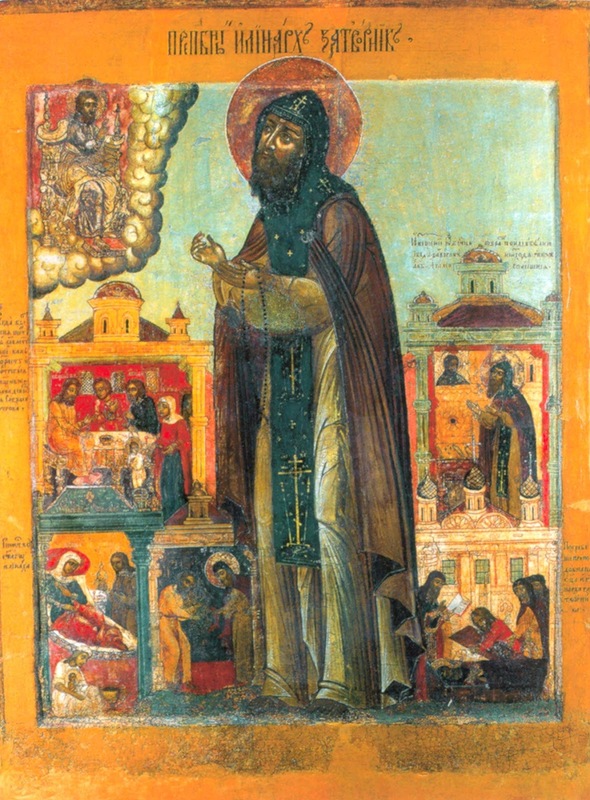 Humbly submitting, Saint Irenarchus again went to Rostov and lived in the Monastery of Saint Lazarus for one year. Meanwhile the abbot of Saints Boris and Gleb regretted his conduct and sent monks after Saint Irenarchus. He returned, blaming himself that he did not live like the brethren who engaged in righteous works, in which he was lacking. The monk continued to bear his own heavy fetters. He made clothes for the needy, and he knitted hairshirts and klobuks. 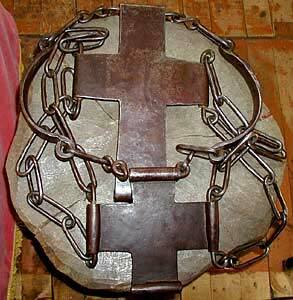 He slept at night for only an hour or two, the rest of the time he prayed and beat his body with an iron rod. Irenarchus had a vision that Lithuania would invade Moscow, and that churches there would be destroyed. He began to weep bitterly about the impending disaster, and the abbot ordered him to go to Moscow and warn Tsar Basil Shuisky (1606-1610) about the terrible misfortune. Irenarchus carried out the order. He refused the gifts offered him and when he returned, he began to pray fervently that the Lord would show mercy on the Russian land. Sapega, remaining at the Saints Boris and Gleb Monastery, wanted to see the Elder sitting in chains, and he was amazed at such an ascetic exploit. When the Polish nobles with Sapega told him that the Elder prayed for Shuisky, the monk boldly said, “I am born and baptized in Russia, and I pray to God for the Russian Tsar.” Sapega answered, “Grandfather speaks truly; in whatever land one lives, there one also serves.” After this Irenarchus began to urge Sapega to leave Russia, predicting death for him if he did not do so. Irenarchus followed the course of the war and sent his blessings and a prosphora to Prince Demetrius Pozharsky. 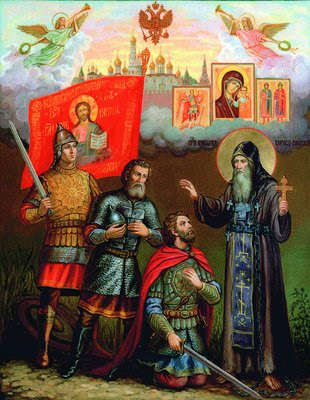 He told him to come to Moscow, predicting, “You shall see the glory of God.” To assist Pozharsky and Minin, the Saint handed over his cross. With the help of God the Russians vanquished the Lithuanians, Prince Pozharsky took possession of the Kremlin, and peace gradually began to return to the Russian land. 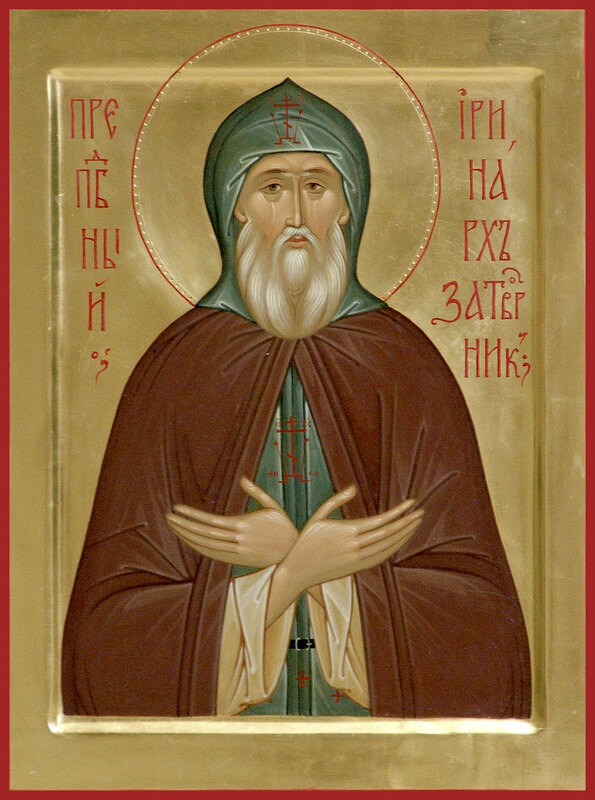 Saint Irenarchus incessantly prayed God with tears for the deliverance of Russia from enemies and, with the power to work miracles, he healed the sick and demoniacs. The day of his death was revealed to him, and summoning his disciples Alexander and Cornelius, he gave them his final instructions. After taking leave of all he quietly fell asleep in the Lord. 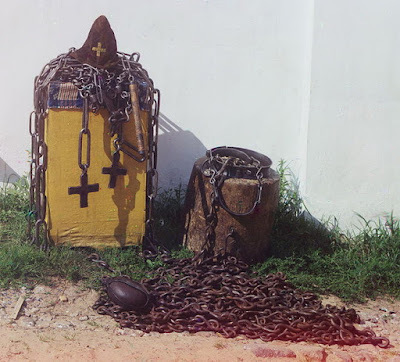 The holy Elder left behind 142 copper crosses, seven shoulder chains, other chains which he wore on his neck, iron foot shackles, eighteen hand fetters, heavy “bonds” which he wore on his belt, and iron rods with which he thrashed his body to drive away demonic temptations.